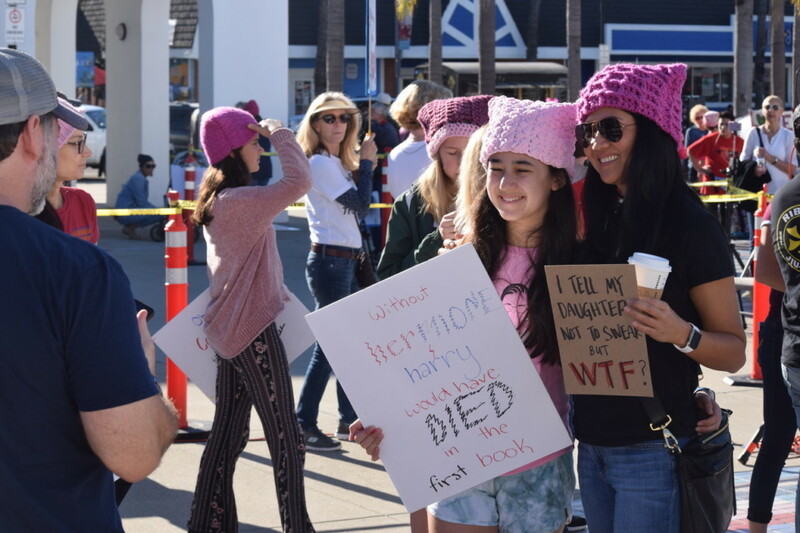 In keeping with the rally-style chants and cheers of North County’s third women’s march on Jan. 19, local activist Laura Jane Willcock bellowed the 1970’s anthem “I am woman” across the courtyard of Oceanside’s civic center. 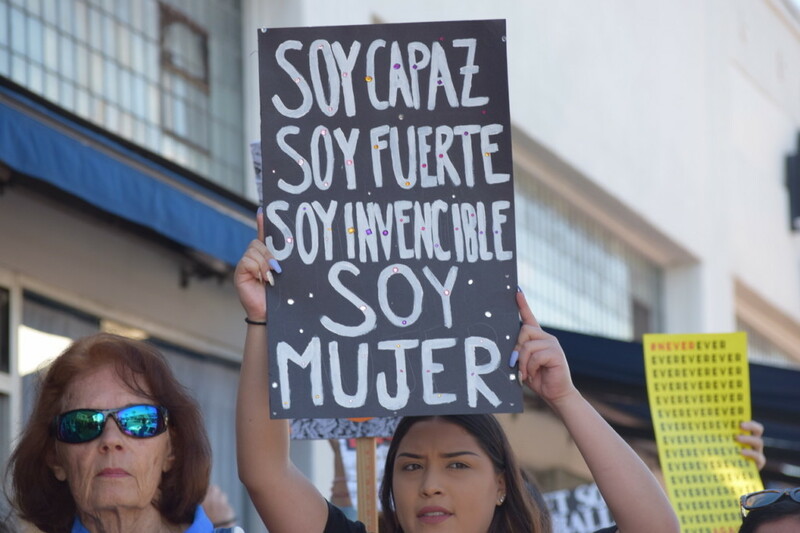 And few songs could’ve been more appropriate, as about 1,000 North County women and supporters joined in on what has become a nationwide tradition since the 2016 presidential election. 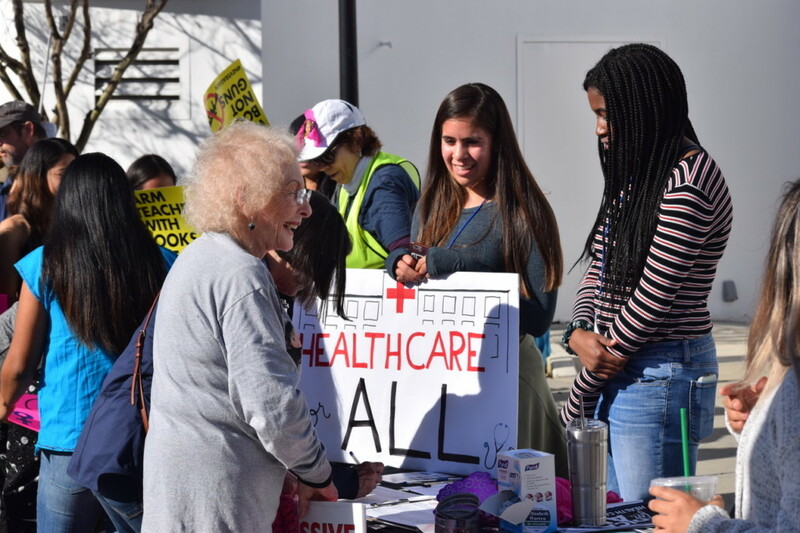 Attendees took to the streets — or more accurately, sidewalks — to not only support equal rights for women, but to protest the current administration and bring awareness to a number of local and national issues. Signs were lifted high and sung messages against gun violence (“Arm teachers with books not guns”), the treatment of migrants along the U.S.-Mexico border (“Seeking asylum is not a crime”), and ties between Russia and President Donald Trump (“get Russia out of our White House”). After marching .7 miles along Coast Highway to the city’s Transit Center, many attendees opted to take a Coaster train to join the San Diego Women’s March downtown. The march was the first of its kind of Oceanside, with the prior two North County marches being held in San Marcos. The first North County women’s march in 2017 drew about 10,000 people. The event was a landmark for many of the event’s attendees and speakers, who see the party-turning tides of the 2018 elections in San Diego as a good sign for area women. The election outcome has prolifically been referred to as a “blue wave,” and North County is no exception. Newly elected Democratic Congressman of the 49th District Mike Levin attended the march, wearing a “I stand with Planned Parenthood” sticker. 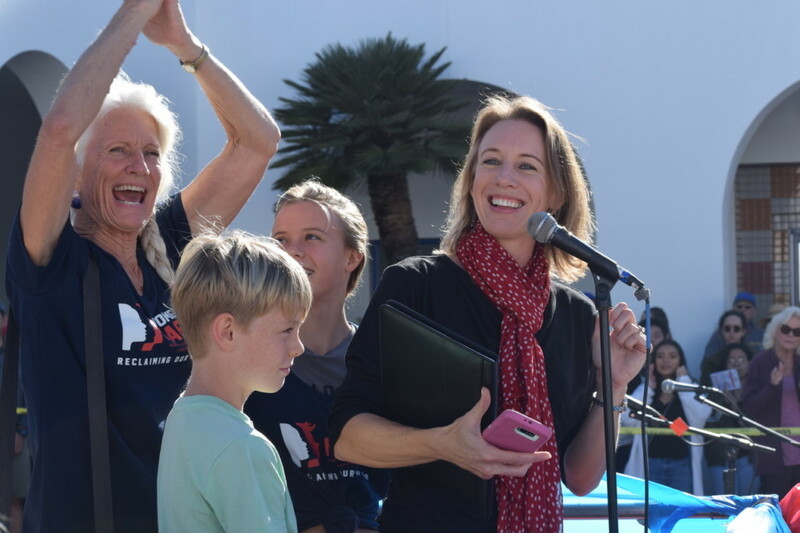 Encinitas Mayor Catherine Blakespear spoke at the 2019 North County Women’s March with her children and mother. “Today we march for ourselves, and we march for each other, and we march for the next generation,” she said. Photo by Lexy Brodt. Resident Carol Hanrahan said that after the election, “it seems like both sides are represented” in what has long been a predominantly Republican region. For others, the event is becoming a yearly family tradition. Resident Yuki Mese made and wore a pink knit cap to the event along with her daughter, a trend that has become an emblem of recent women’s marches. “I’ve always told her having a voice as a woman is one of the most important things in the world,” Mese said. Men also attended in droves, feminist T-shirts and all. Jim Brown, a Vietnam War veteran with Veterans For Peace, marched in support of female veterans. Attendee Joshua Lazerson participated in the march holding a sign with the message: “Men can listen, men can validate women’s experiences, men can lead in raising generations of better men.” He feels men have a responsibility to advocate for women. “I don’t know why we haven’t, but that’s my small movement in that direction,” he said. 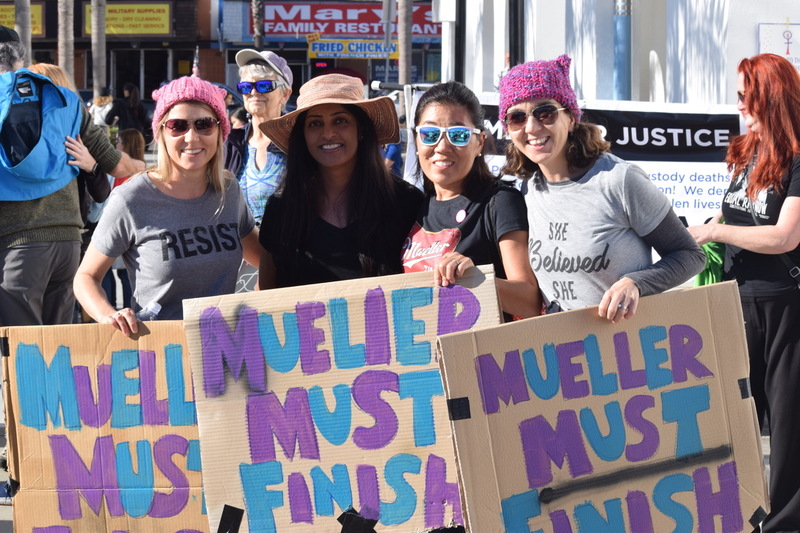 According to Tazheen Nizam, a former Vista City Council candidate who helped organize the two previous North County marches, the participation of men in the march is nothing new. “Men show up; and they better!” Nizam said. Nizam said the event helps show women community. “It’s very important because we show women that they’re not alone, they have a community, and they have support when they decide to go outside and run for office, or take charge, or organize, or be an activist,” she said. 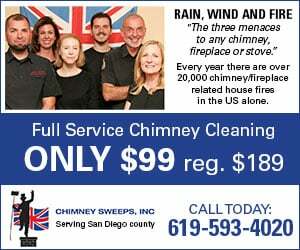 The event drew several local female politicians — with Encinitas Mayor Catherine Blakespear at the helm. The speakers encouraged attendees to get involved and create platforms for women and people of color in local government.